Working whenever I have a few minutes to sort through my treasures from this weekend’s citywide garage sales. 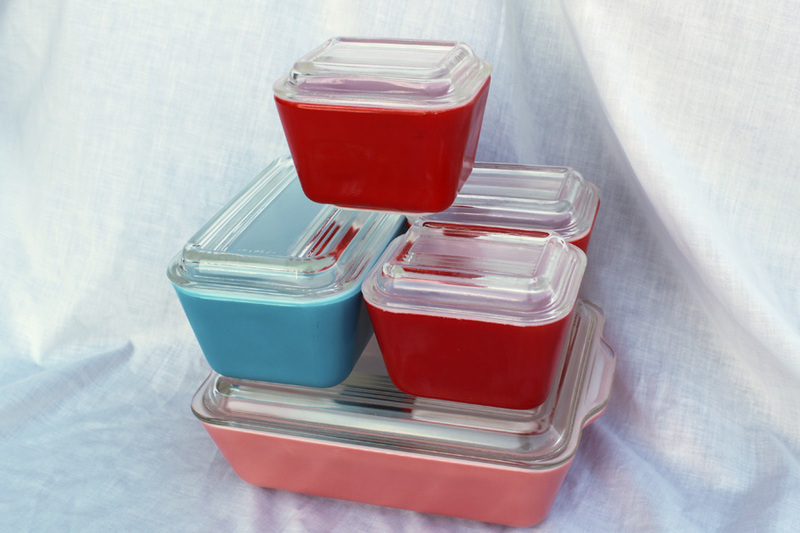 Absolutely love this set of 5 refrigerator dishes and lids. They are colorful and have absolutely no chips in them. That is hard to find. Fun melamine dishes from National Airlines. I believe they are from the late 50s or early 60’s. They were used when airlines actually used reuseable dishes on a flight to serve food. National Airlines merged with Pan Am in 1980 so these are a wonderful vintage find. This almost makes me long for the days long gone when service on airlines was at a premium. But then again, people smoked like a smoke stack then too. For someone who has allergies to smoke, that wouldn’t be so great. 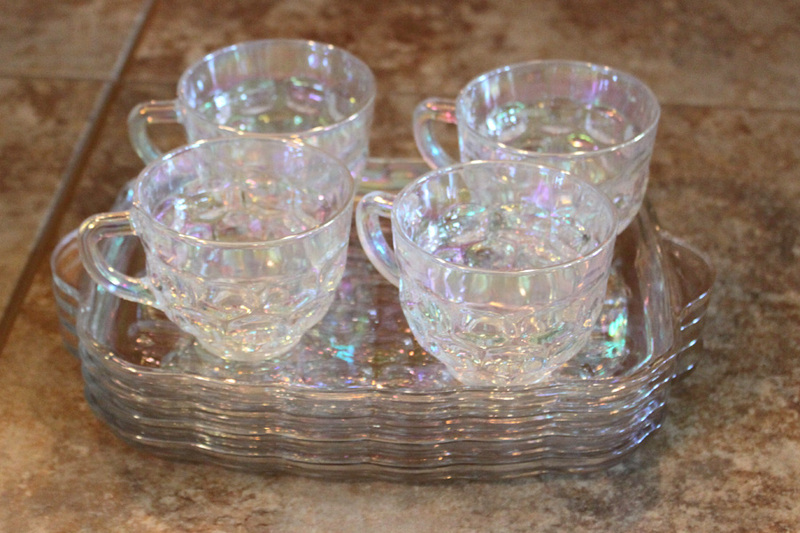 In my area you can find snack sets from the 1950’s and 1960’s all the time, but these are a irridescent glass and are absolutely stunning. 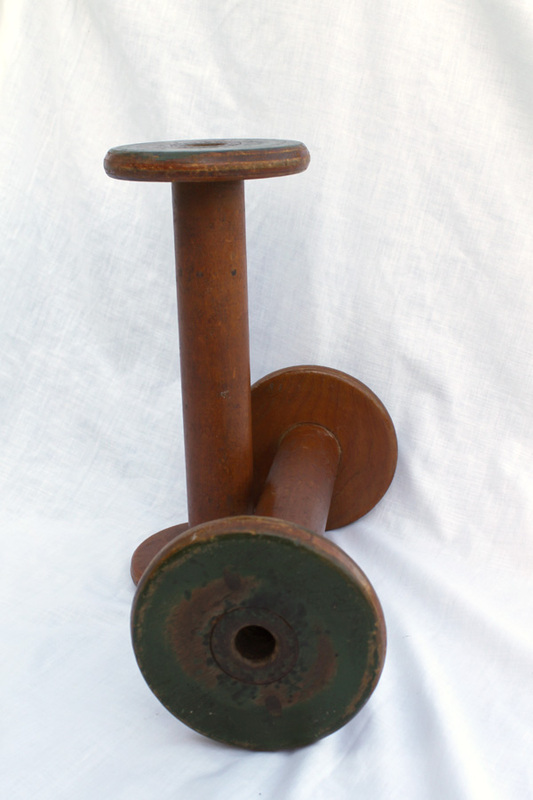 These industrial spools are 11.5″ tall and they are made of wood. They are so fun. Love the chippy green paint on the ends. I can see using them as is, painting them, making them into bookends or even candlesticks. Very fun. 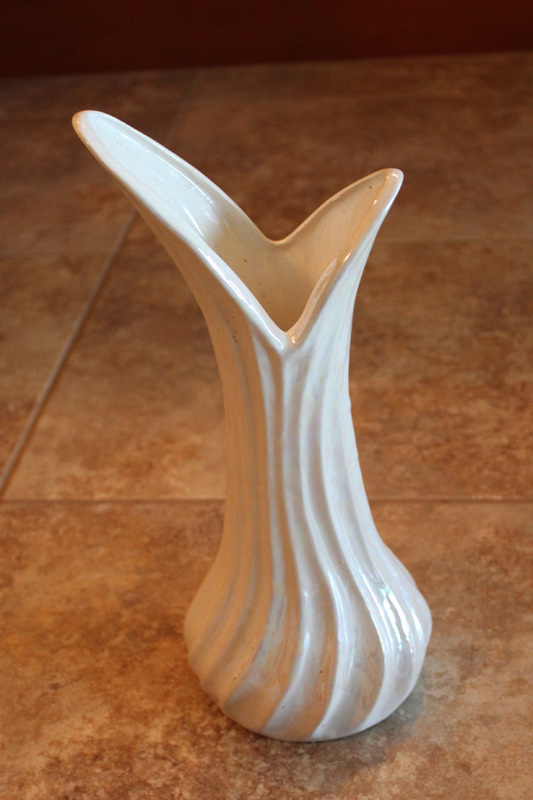 The final find for today is this amazing opalescent white McCoy vase. I was so surprised to see it at a garage sale at around 10:30 in the morning. I can’t believe it wasn’t snatched up. It has no chips and is just beautiful. I will try to blog a few more finds this week. However, I am working hard to price items for my garage sale coming up this Friday and Saturday. Linking up to: Hey What’s for Dinner, Mom? Wow, what a haul! From the Pyrex (which I am very envious of) to the beautiful vase you found wonderful treasures. 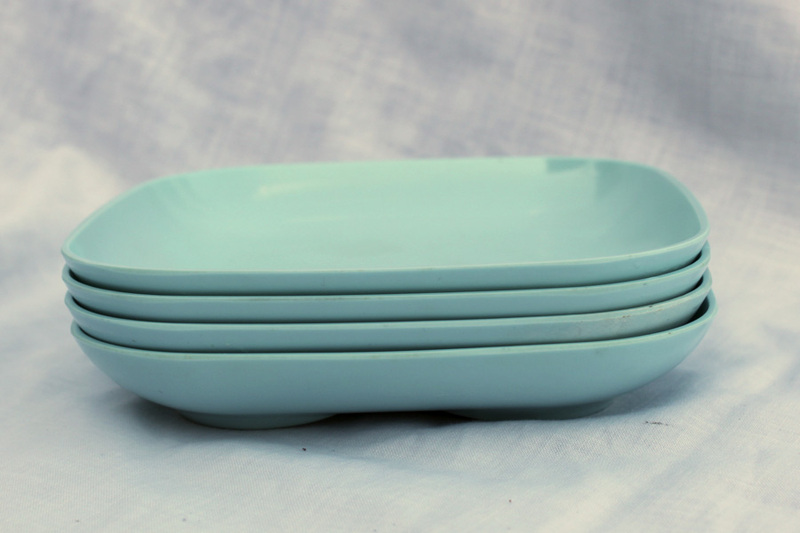 I love the dishes – the shape, color, and where they were used. You did well congrats. Thanks. It was a really great weekend of finds. Hey, hard to tell but that snack set might match ours. We’ve been looking for a match to have a set of 8. If it matches, we might be willing to take them off you’re hands — if you’re willing to part with them. If it does, it is yours. You need to bring a picture of the set so if this one doesn’t match we can find you one. I see all kinds at sales around here. Wow! Those refrigerator dishes are a wonderful find. The National Airlines dishes are super cool. I’ve never seen these anywhere; I think you’ve got quite a buy there. I love snack sets, just can’t seem to get enough of them. The irridescent glass is a new one for me; never seen those either. Love all your great treasures! Thanks for you comment. I hadn’t run across anything like the NA dishes before. I listed those in my shop and already have interest so there must be others out there that think they are fabulous. I wish I knew which company made these irridescent glass snack sets. I hadn’t seen them before. They are sitting on my counter sparkling right now. so fun. Again. thanks. Love those glass dishes with lids…are they truly Pyrex? Would love to come across some of those myself. Looks like you had a great time treasure hunting!! Yes the refrigerator glass has Pyrex marked on the bottom of them. I have to admit, I was so tickled when I was able get them in my possession.